AC/DC power supply / single-output / DIN rail / compact - SPS-24/1,5 - SIMEX Sp. z o.o. 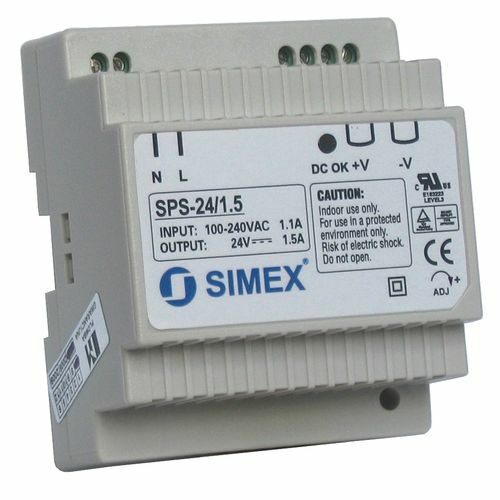 Electricity - Electronics - Optics > Power Supply > AC/DC power supply > SIMEX Sp. z o.o. SPS-24/1,5 SIMEX Sp. z o.o. The SPS-24/1,5, manufactured by SIMEX®, is a 30-W single output industrial DIN-rail power supply which features a fan-less design for compatible installations involving TS35/7,5 or TS35/15 industrial rails available as a slim line 30-W unit. This device is specifically designed for general industrial applications involving the following: factory automation, electro-mechanical industry, data communications, IT, power distribution boxes, control panels, building automation and household appliance control.